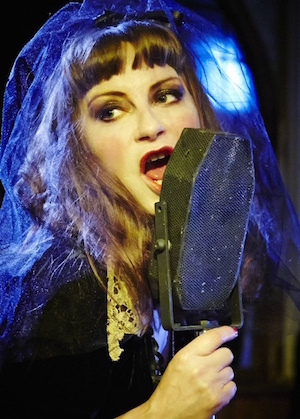 Louder Than War’s Carl Stanley talks to urban jazz singer Collette Cooper ahead of her gig at Manchester’s The Formal Fight Club on Saturday 18th October. Performing songs from her upcoming album City of Sin, due out at the start of 2015, exuberant urban-jazz singer and actress Collette Cooper will be returning to her home city of Manchester this weekend to appear at this year’s Formal Fight Club boxing event at Manchester’s Palace Hotel, titled ‘Rumble in the Jungle’. Louder Than War caught up with the singer and actress to talk about her debut album, her acting, her famous friends Scarlett Johnson and Nick Grimshaw and her plans surrounding next year’s release. Louder Than War: Hi Collette and thanks for talking to Louder Than War. It’s been a pretty exciting last two years for you and you’ve had some great reviews for both your live shows and music. But for you right now it’s all about your upcoming debut album ‘City of Sin’ which you’ve put together with the help of a Pledge Music campaign – how’s it coming along? Collette Cooper: My album City Of Sin will be finished in a month. It should have been finished in September but we had a few delays, which is what happens when you want to work with certain musicians, you have to wait until they are available and when they are at the top of their game … it can be a long wait! I am proud to say I have worked with the best jazz musicians around on this album and my co-producer Dan Lipman has been more than instrumental in completing the project. It’s all recorded onto tape (old school way) using one of the best analog mixing consoles SSL G series, so it sounds very authentic. I’m an unsigned artist through choice of my own and I’m raising money from a great site called pledge music. I have 23 days left to raise £5000. Which will cover some of my costs. Your style has been described as being ‘Edith Piaf with a touch of Nina Simone’ – that’s some comparison; who have been your influences and how would you describe your sound and singing style? I’m very flattered to be likened to Edith Piaf on occasion. People seem to always want to compare you with somebody. I’m just doing my own thing and would hope I’m original. My biggest influence is Bessie Smith. I loved her passion and her voice. My sound is eclectic. Some of it has a feel of 1930s New Orleans and then wartime Berlin. I’m not trying to have any particular one sound a such, I’m just doing my own thing and seeing wherever it takes me. Your last song, Bonkers, is from an album that was released earlier this year. Its modern urban jazz backdrop and accompanying video (see above) has had a wonderful reaction online … would you say it’s a good example of what to expect from City of Sin? Bonkers is a fun song. Its Dizzee Rascal’s rap and I put my melody to it. It’s been well described as Urban Jazz. I’m really pleased with the response it’s had. It also sets the standard for my album. I’m really looking forward to making my next music promo too, which will be directed by Ben Charles Edwards. You’ve been building a name for yourself over the last two years playing in and around the capital, describe to us what your live shows are actually like? It all depends where I gig to how the show is. Most of the time I work with a big band and the energy is great! We improvise a lot so you never know where it’s going to take us. I work with an amazing, talented bunch so it’s always going to be interesting. If I play at fashiony things or charities and they don’t have the facilities for a full band, then I work with the instrumental version of my music which is on CD and take Kevin my trumpet player and Dan my sax and clarinet player, along with me to accompany the track. Although its still exciting and the drama is there, I try not to work this way as I much prefer to work completely live with all my musicians. In an era where we seem to be forever looking back and revisiting the classic sounds and genres once again, from the 50s or the 90s, do you feel it’s time for a whole new rediscovery of acid blues, something with a modern cabaret feel to it? I think it’s in our nature to want to revisit the past musically because past generations will always remind us “it was better back then” And we will always, naturally have influences along the way. There is always room to revisit any era. Its just a matter of taste. There are no rules in art, or there shouldn’t be anyway, I think anything goes. Why not! Aside from your music you’re also an actress too and your career has taken in theatre as well as film. It includes an appearance in the brilliant 24hr party people and has seen you work with people like Michael Winterbottom and Noel Fielding, but what have been some of your own personal acting highlights and why? Theatre is something that will always excite me. I will always prefer theatre over film, although I do enjoy the process of working on film. Theatre is a far better journey for me. I approach my work as an actor the method way and in theatre I’m able to really embrace the character without any interruption which is sometimes difficult when doing film because there is so much going on around you. Plus I tend to eat all the yummy set food and get fat :-) I have many personal highlights working both in theatre and film but the best one has yet to come I think. For a bit of fun you recorded a novelty song ‘Selfie’ with Scarlett Johnson didn’t you, plus you also worked on Nick Grimshawe’s Breakfast show too … how have you had such a varied career? Yes that was fun and I thought why not… it’s a laugh. And what a good laugh Scarlett Johansson is for doing it too! I never want to take life too seriously, or my career… Yes, I consider myself as an artist but I don’t want to be wanky about it “Oh I’m an artist, therefore I have to take myself seriously” (Can I say that word..? :-) ) The way I see it, I can do what I want … why not? As long as I’m having fun and do it to the best of my ability. I love doing work on Grimmy’s show. He’s one of my best pals and we have a laugh. Well he’s more like family really. I’m looking forward to our next little comic sketch! October the 18th sees you come to Manchester to play at the city’s popular Formal Fight Club event at The Palace Hotel; a black tie event titled ‘Rumble in the Jungle’ … how did that come about? I’m looking forward to performing on the 18th. I’ve never performed anywhere like this before and I’m not quite sure what to expect. I was asked to play by a lovely, wonderful lady who runs the whole thing. Tracey Donnelly. It’s also nice to perform on my own turf too, being a Manchester lass. Lastly … when will City of Sin be released and will you be playing shows to support the album? My album City Of Sin will be completed in a month, but I won’t be releasing it until the launch in February 2015. I will be hitting all the festivals next year to promote it. A lot of blood, sweat, tears, passion and soul have gone into the album over the last 3 years. I’m very excited to finally finish it! You can find Collette Cooper’s Pledgemusic page here: pledgemusic.com/artists/collettecooper. Collette is also on Facebook and she tweets as @collettecooper. The Formal Fight Club can be found on Facebookand Twitter (@FormalFightClub) for more details about Collette’s upcoming Manchester show this Saturday. All words by Carl Stanley. More writing by Carl on Louder Than War can be found at his author’s archive.